In the last decade of the nineteenth century, two elderly Australian gentlemen fought a public battle that rumbled on in the press for nearly fifty years, to determine who was the "Dandy Horse Grandfather" of Australian cycling. The first person to ever ride a bicycle on Australian soil? To prove their point, Australia's bicycle riding grandfathers chose the dandy horse, both believing that this non pedal powered machine, constituted the earliest exemplar on which to stake their claims. To learn more about the battle of Australia's dandy horse grandfathers, let's go back to 1818 in Europe and another important grandfather of invention, this time of the photographic kind. Nicéphore Niépce had in his possession a new invention, devised by Baron von Drais, known in France as the "Draisienne". A few years later Niépce would be credited as the inventor of photography, but in the meantime he contributed to the world of bicycles by creating his own name for these new man powered machines. The name Niépce gave them was “Velocipede,” a word which would describe any type of machine with one to five wheels. So in describing a bicycle, it would be called a”bicycle-velocipede,” or if it had three wheels a "tricycle-velocipede". Not much comfort on the seat of the wooden steed. Striking the ground with your feet from the seat of the dandy horse did not prove to be the most popular forerunner of the modern bicycle. By the summer of 1819, it was fashionable to be seen on the streets of Paris and London on a dandy horse, but not in Australia, or even Van Diemen's Land. The first reference I could find to a "bicycle" in Australia was in Hobart Town, Van Diemen's Land. In about 1820 Kemp & Co of Macquarie Street imported and sold just about anything and everything. If you owned a house in Van Diemen's Land, went fishing, shooting or took up farming, Kemp & Co could provide furnishings, drapery, wine, hooks, lines and sinkers, shot for your rifle, a plough for your farm and if you were staring in the window of Kemp & Co at the right time, a velocipede. It was going to be a long ride along the evolutionary line of bicycles, motorcycles then cars. Yet this velocipede in Kemp & Co’s window, was a forerunner to all of these. On the 21st of April 1827, the ship Tiger docked at Hobart, Kemp & Co's inventory on the Tiger included 4 drums of figs, 36 hams, 1 velocipede, 50 kegs of beer, 2 casks of wine, 53 kegs of white lead, 152 bags of shot, and 34 kegs of nails. So a full eight years ofter the "Dandy Horse" craze of the summer of 1819 a Velocipede landed in Hobart. Do you reckon someone must have tried riding it? I'm sure Kemp & Co didn't sit it in their shop window with a notice attached that read, "Finally arrived on these antipodean shores, better eight years late than never, one velocipede, to be looked at and never ridden." It's hard to know how many wheels Kemp's version had so we can't confirm that it was of the two wheeled kind. Yet someone in Hobart in 1827, must have ridden at least this one velocipede. Sports weren't mentioned in the Hobart Town Gazette, the creation of a colony, planting hawthorn hedges, finding lost horses or stolen roofing lead were more pressing at the time, than nurturing ideas of riding a dandy horse. The next mention I could find of a Dandy Horse was again in Hobart in 1830. Van Diemen’s Land "The Dandy Horse. To find the first description of a person actually riding a velocipede in Australia we must first turn to the world of fashion for guidance. The dandy horse craze of 1819 was part propelled by fashion and in Sydney in March 1831 it was no different, where an already unfashionable "Exquisite" was observed riding a velocipede. With metal shod wheels, dodging pedestrians on foot paths or horse nuggets on the street. No brakes and the machine had to be made to suit the height of the rider, so the feet could reach and strike the ground. It's no wonder we had to wait until the 1860's for the velocipede to take off. We can't be sure that the "Exquisite's" velocipede had two wheels, although given the description of the guiding wheel and the machine capsizing head over heels, it's a fair bet that our exquisite was riding a two wheeled dandy horse. Five years after the exquisite was seen riding at a Sydney race course Christopher May, one of the dandy horse grandfathers laid claim to being the first dandy horse rider in Australia at Brickfield Hill in 1836. A controversial second ride for Christopher May, afterwards asked not to disturb the minds of the people of Windsor with his dandy horse again. Not all beer and skittles if you were game enough to head off down the main street of Windsor on a dandy horse on a Sunday afternoon, with a rough element about. Especially when no other dandy horse had ever been seen before. Next in 1845, becoming the first rider of a dandy horse on this antipodean side of the planet went from riotous to bizarre. Given that a dandy horse required the rider to strike the ground with their feet, the Dandy Horse Match was bound by outlandish rules. The rider of this dandy horse was not allowed to touch the ground with either hand nor feet! In December 1845 odds were placed at 5, 6 and 10 to 1, against the riding of the dandy horse. A week after the event it was declared a hoax. Another interval of eleven years and a Dandy Horse is again mentioned for sale in Hobart, this time the wooden horse is advertised as "A VELOCIPEDE, OR DANDY HORSE, On a new and novel principle, and easy of propulsion." Only thirty six years late, this dandy horse wasn't quite the newest invention. Finally the second player and most vocal, in the Battle of the Dandy Horse Grandfathers got his chance to make an appearance. 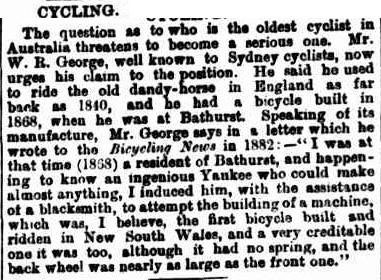 W.R George had a bicycle built, one of the new pedal powered bicycle-velocipedes, in 1868 at Bathurst. Thirty two years after Christopher May had upset the people of Windsor with his daring and almost riotous dandy horse ride of 1836. W.R George in claiming his title of the first bike rider in Australia said that he'd been riding a dandy horse regularly back in England, but that was in England in 1840 not Australia. By the time W.R. George threw his leg over his two wheeled pedal cycle in 1868, there were probably countless other dandy horse riders who had preceded him. To be fair to W.R George, he was definitely one of the first to ever ride a bicycle in Australia that was fitted with pedals, on a machine without requirement to strike the ground with his feet to obtain forward motion. "A great controversy was going on in the Sydney and Melbourne Press .. as to who was the first cyclist in Australia, and a Mr. george (Sydney Bicycle Club) claimed to be the father of cycling. However, the late Mr. J.C.L. Fitzpatrick, M.L.A pointed out in his book, "The Good Old Days," and relating to the early history of the Hawkesbury district that "as Mr George's experience only dates from 1866, or later, I think Mr Christopher May, of Pittown, near Windsor, can well lay claim to the honour, for he was the owner of a 'dandy horse, ' and rode along Brickfield Hill (Sydney) in 1836." This pattern of repeatedly examining the claims of George and May, rumbled on for nearly fifty years from the early 1890's. It doesn’t really matter which of them was first. It does raise the question though of what was it like to be the first person ever to ride a bicycle? To experience a pair of wheels underneath you, with scant reference to terminology to describe what it was that you were riding, and with no guidance on how you might ride. The surprise of a bicycle ridden down a public street where no one had ever seen a bicycle before, let alone seeing one being ridden, perhaps was the most challenging aspect for early Australian bicycle riding pioneers. "It is the rage in Paris, and at country chateaux throughout the empire hosts and guests indulge in velocipede races, instead of watching their horses run under the whip of weazen faced jockeys. Every ubiquitous advertisement bearer scuds through the streets on a velocipede … all ride the new iron horse. These modern centaurs are as wonderful as was the apparition of the Thessalonian horsemen .. of the ancient hippogriff or the original Centaurs .. since the time of Bellerophon, the first equestrian ; of Pelethronius, since the days when Proteus drove his two legged horses and the Sapithae spurred their bitted steeds over the plains of Thessaly ; since Phaeton's ride behind Pyrois, Eos, Aethon, and Phlegon, the chariot horses of the sun, to which even Follows's four-in-hand could not hold a candle - there has been no racer or hack to match the veloce for elegance, grace, docility and speed." Buster Keaton riding a dandy-horse in the 1923 film Our Hospitality. Aspirants to the art of velocipedian locomotion, keeping the brute in order. If describing the new found bicycle wasn't enough, trying to learn to ride one was another thing altogether. These early velocipedian locomotive aspirants could not have imagined that in tracing an interminable letter S or not keeping “their brutes” in order, how far the new path they were tracing, would lead. To drive our cars planted on terra firma with four wheels and an engine, or watch a moto gp bike hurtle around Philip Island racetrack laying down rubber at blistering speed, and to all you modern centaurs who choose from a myriad of velocipedian options for your latest pedal powered mission, your only limit now for man and machine is your own imagination, and that’s where it all began. Colour Dandy Horse images by Robert Cobcroft, of a Dandy Horse Replica which belonged to the late bicycle collector of Toowoomba, James Macdonald. Dandy horse tethered to the kitchen bench. A replica from the bicycle collection of the late James Macdonald of Toowoomba.